All transactions are safe and secure with a reliable history in online purchasing behind each of our associates. 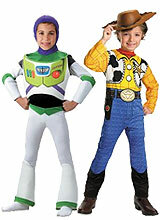 Buy the Toy Story Costumes to own Toy Story clothing and merchandise. Every kid wants a Toy Story costume and this year is no different. We have cowboy Woody, cowgirl Jessie, Army Men, Alien and Buzz Lightyear costumes just to name a few. They come in a variety of styles and sizes for children and adults. If your kids are like mine, they like to dress up randomly all year so the outfits get more than just one use. Any costume is bound to provide countless hours of fun for the child in your life, so get one today. Be sure to check out Toy Story clothing and merchandise available here to add to the adventure. In addition to the Toy Story Costumes above, browse the Toy Story Clothing Gallery for more apparel like men's and women's clothes, kids shirts or hoodies.